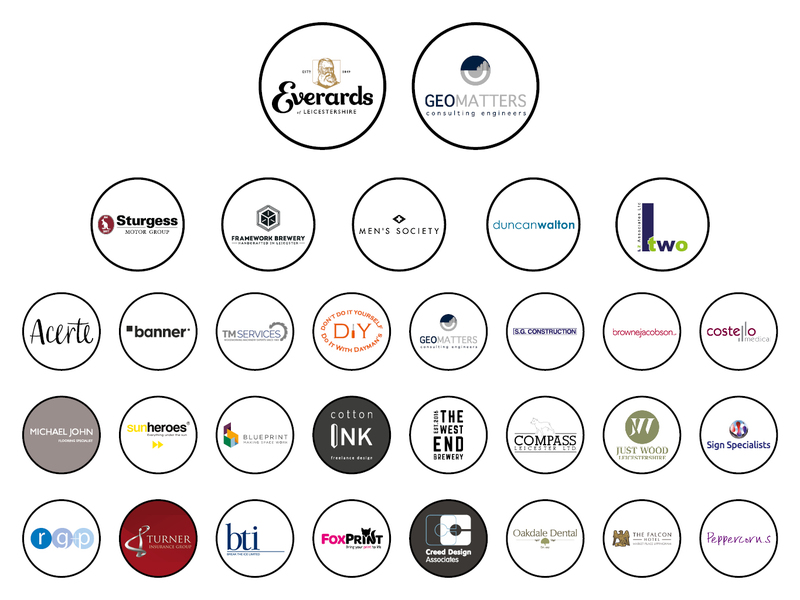 In 2018 we said a huge thank you to Everards and to Geo-Matters for stepping up to be main festival sponsors, as well as saying a big thank you to our bar and firkin sponsors. We couldn’t do what we do without you. Thanks to our amazing sponsors in 2018, we were able to donate £10,500 to charity this year, and we hope to do even better in 2019! If you would like to sponsor the festival in 2019 read on to learn more about the festival and the ways in which you can support our charitable aims or get in touch with any questions. Download our 2018 sponsorship information here. The Western Park Beer Festival aims to turn every £1 in sponsorship into £2 for our chosen charity. By sponsoring a firkin, your £100 will be converted into £200 for good causes in the Leicester area. The festival is not for profit and run solely by volunteers for the benefit of the local community. All proceeds are ploughed back into Leicester and Leicestershire. The festival itself provides an opportunity for the people of Western Park and those further afield to come together and enjoy a good variety of mostly local beer and some fine local food. While supporting the charity beer festival will give you a little warm glow, we know warm glows don’t pay the bills. Fortunately, your support offers a tangible business opportunity too. As the festival sponsor, bar sponsor or a firkin sponsor, you, your staff and clients will be invited to an exclusive brewery tour. The tour will be led by an industry professional and all guests will be invited to sample several beers after the tour, during a casual networking opportunity with fellow sponsors. In addition to your business being associated with the festival, your brand will also be included on printed materials. You will also have the opportunity to place adverts within our programme, website, and on our Facebook page, Instagram and Twitter account. By becoming a festival sponsor your company name will be placed into 10,000+ West Leicester households, with 1,500 attendees expected over the two days. This will happily align your company with our efforts to improve the local community through the unifying medium of beer. Each year we choose a local charity or good cause to receive the proceeds from the festival. This year our main charities are Action Homeless and The Bridge Leicester. Action Homeless provide emergency housing, temporary housing, longer term homes, and play groups, family trips and parenting support for families with young children who have been affected by homelessness. The Bridge Leicester provide over 180 meals per week, mentoring to support homeless and vulnerably-housed adults, as well as warm clothing, temporary accommodation and an advice centre. Along with homelessness, in 2018 we will also be supporting the Western Ward Community Enterprise’s fundraising for the park buildings renovations and the UK Sepsis Trust’s campaign to improve sepsis care in the UK.